The term synovium refers to the soft tissue lining the spaces of diarthrodial joints, tendon sheaths and bursae. It includes the continuous surface layer of cells (intima) and the underlying tissue (subintima). The intima consists of macrophages and ﬁbroblasts while the subintima includes blood and lymphatic vessels, a cellular content of both resident ﬁbroblasts and inﬁltrating cells in a collagenous extracellular matrix . Between the intimal surfaces is a small amount of fluid, usually rich in hyaluronan (hyaluronic acid). Together, this structure provides a non-adherent surface between tissue elements. Unlike serosal surfaces which also have non-adherent properties, synovium is derived from ectoderm and does not contain a basal lamina. The synovium is the central area of pathology in a number of inflammatory joint diseases, including rheumatoid arthritis (RA) and spondyloarthritis (SpA). However our knowledge of the immuno-histochemical architecture of the synovial membrane, particularly in normal subjects, is surprisingly limited. The normal synovial membrane is stated to be a relatively acellular structure consisting of a distinct intimal lining layer of 1-2 cells thickness and a synovial sublining layer. The latter is relatively acellular, containing scattered blood vessels, fat cells, and fibroblasts, with few lymphocytes or macrophages. Typically, the normal synovium contains an intimal layer which is 20-40mm thick in cross-section and an areolar subintima which can be up to 5mm in thickness. At many sites there is no discrete membrane, especially where subintima consists of fat pad or ﬁbrous tissue. However, often there is considerable variation of the typical normal synovium appearance, including absence of intimal cells [1-3]. Superﬁcial bursae may contain little or no hyaluronan-rich fluid. 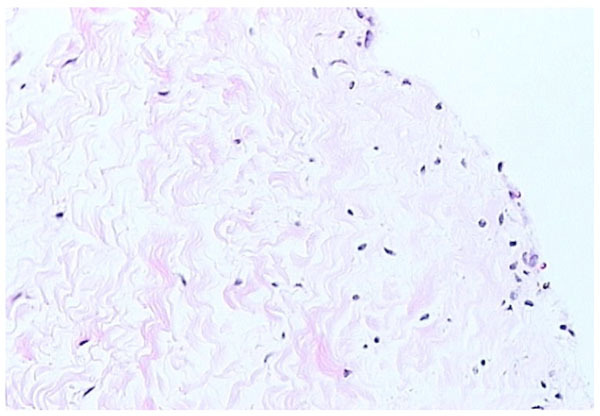 Ganglia are sacs containing hyaluronan-rich fluid but do not occur at sites of shearing and do not have a typical intima and so may not really be synovial tissue at all. Diseased synovial tissue may lose any recognizable lining structure and only be deﬁnable by its relation to a joint. 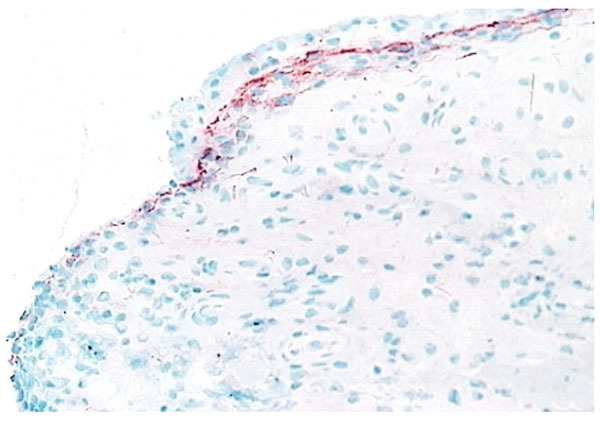 In patients with inflammatory arthritis, such as RA, the intimal lining layer is usually markedly thickened, mainly due to an increase in CD68 positive macrophages, with a heavily infiltrated subintimal region, containing T and B lymphocytes, plasma cells, and macrophages, associated with stromal oedema and proliferation of blood vessels. The microscopic anatomy of normal synovial tissue often falls into three main types [1, 4], based on the structure and content of the subintimal layer: ﬁbrous, areolar and adipose (Figs. 1-3). In some areas of the body, the subintima may consist of periosteum, perimysium or even hyaline or ﬁbrocartilage. Synovial macrophages. 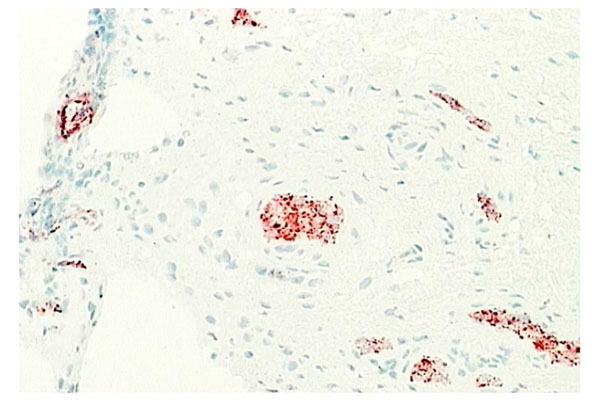 Normal synovium (X200 magnification) stained for CD68+ macrophages (red) (contrast with Figs. 5, 6). 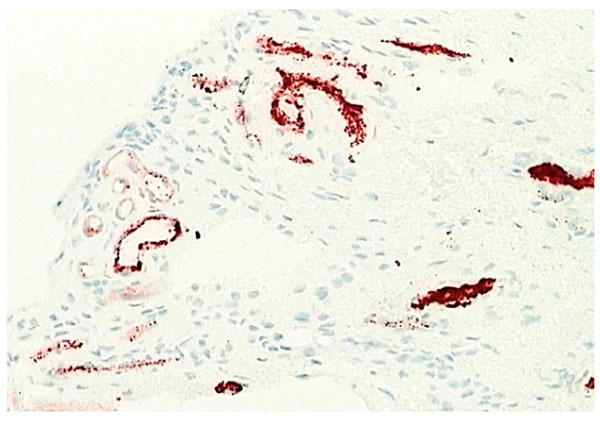 Normal synovium (X200 magnification) stained for CD55+ fibroblasts (red). Synovial fibroblasts make up most of the cells in the lining layer in the normal synovium intimal layer in contrast to RA synovial tissue (contrast with Figs. 4, 7). The areolar type of normal synovium is the most specialized form (Fig. 1). It is often crimped into folds, which may disappear when stretched or it may contain projections or villi. There is usually a continuous layer of lining cells often two or three deep on the tissue surface [1-3]. Immediately beneath these cells are capillaries, with a deeper plexus of small arterioles and venules, associated with mast cells [5, 6]. Lymphatic vessels are present in all types of normal synovial tissue, although they are infrequent in the ﬁbrous type of normal synovium. The lymphatic vessels are usually found in the deep subintima and ﬁbrous layers of normal synovium , while in synovium from RA patients lymphatic vessels are widespread and numerous. Nerve ﬁbres are present in synovium usually in association with blood vessels . 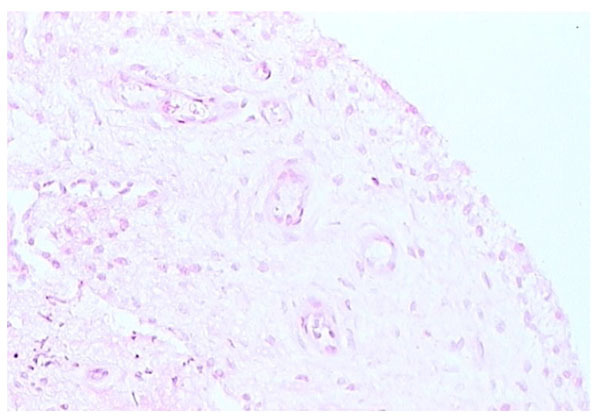 The connective tissue matrix in normal synovium includes a fine fibrillar matrix with a few type I collagen fibres in the intima, beneath which is a layer relatively rich in type I collagen which forms the physical membrane. The deepest area of the normal synovium consists of a loose connective tissue layer which allows the membrane to move freely. Below this loose layer there will often be found ligament, tendon or periosteum. 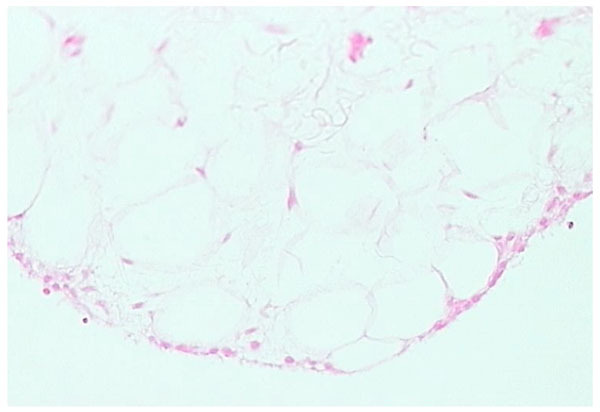 Adipose synovium is found mainly in fat pads but is also seen within villi (Fig. 2). There is a complete intimal cell layer and a superﬁcial net of capillaries. The intima may lie directly on adipocytes but is often separated by a band of collagen-rich substratum, while the deeper tissue is fat. Villi usually have a central arteriole and venule but can be avascular. The amount of fat in villi varies and probably decreases with age, with an increase in ﬁbrous tissue. Fibrous synovium is often difﬁcult to deﬁne, consisting of ﬁbrous tissue, such as ligament or tendon, on which lies an intermittent layer of cells (Fig. 3). Fibrous synovium may be indistinguishable from ﬁbrocartilage, especially in the annular pads found in ﬁnger joints. Two types of intimal cell have been deﬁned in normal synovium, utilizing electron microscopy . The type A synoviocyte has cell surface markers identifying it as being from macrophage lineage while the type B synoviocyte is of ﬁbroblast lineage [1, 2, 11]. Type A synoviocytes are probably true macrophages, derived from blood monocytes, while type B synoviocytes are intimal ﬁbroblasts which are locally derived [1, 2]. In most disease states, such as rheumatoid arthritis, intimal cells increase in number. This is probably due to a number of processes, with macrophage influx from the vascular compartment under cytokine and cell adhesion molecule control being the dominant process [1-3, 10]. 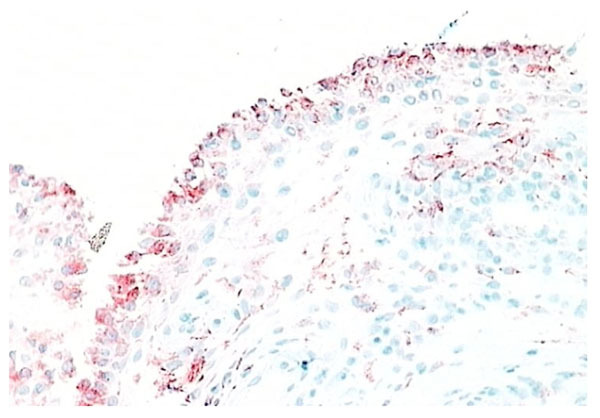 Macrophages are found both in the intimal and subintimal regions of normal synovium. Intimal macrophages carry typical macrophage lineage markers. They show prominent nonspecific esterase (NSE) activity and are strongly positive for CD163 and CD68 but less so for CD14 (Fig. 4). Intimal macrophages also express the immunoglobulin receptor FcgRIIIa, while subintimal macrophages usually express low levels of FcgRIIIa or are negative . However, macrophages make up a minority of cells in normal intima (Figs. 4, 5), while the numbers in inflammatory arthritis increase dramatically and in RA synovial tissue account for up to 80% of the intimal layer (Figs. 6, 7). A usual pattern is that of a superﬁcial layer of macrophages with an intimal phenotype below which is a layer of intimal ﬁbroblasts. 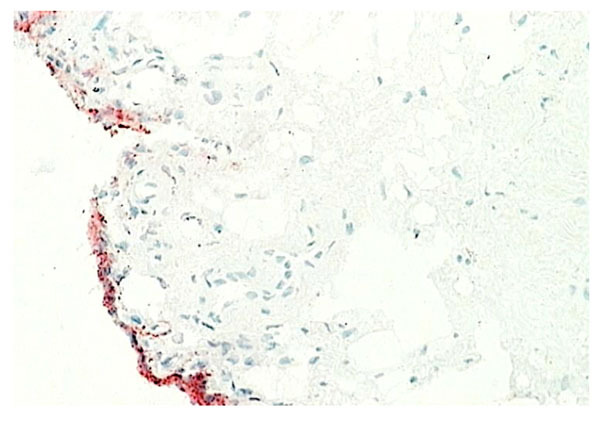 In the subintima, there may be a zone of NSE-weak, strongly CD14+ FcgRI+ macrophages, associated with venules. There may also be a small number of antigen-presenting interdigitating dendritic cells in normal synovium [13, 14]. Evidence to date indicates that both intimal and subintimal macrophages derive from bone marrow via circulating monocytes, many of which probably arrive via subintimal venules and migrate to the intima. Type B synoviocytes have adapted to the production of hyaluronan. CD68- intimal ﬁbroblasts alone demonstrate high activity of the enzyme UDP Glucose dehydrogenase (UDPGD) which converts UDP-glucose into UDP-glucuronate, one of the two substrates required by hyaluronan synthase for assembly of the hyaluronan polymer . In inflammatory arthritis, UDPGD activity in intimal ﬁbroblasts is reduced. Synovial intimal ﬁbroblasts express CD55 (Fig. 5) and this marker can be used to distinguish intimal ﬁbroblasts from intimal macrophages [1, 2, 16]. 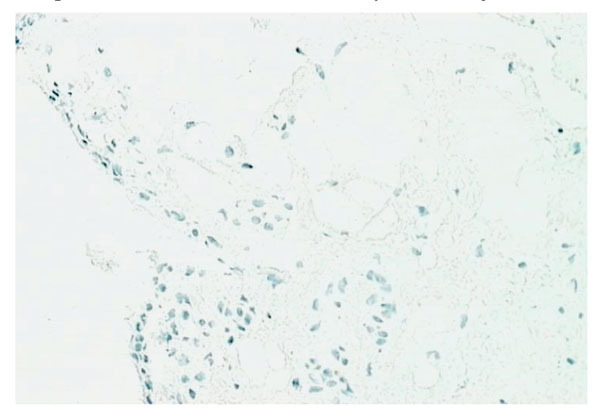 Cell suspensions generated from inflamed synovium and grown in tissue culture display ﬁbroblast characteristics and ramifying processes with production of high levels of metalloproteinases . It is not known whether the source of these cells is from intimal or subintimal fibroblasts. Collagenase and gelatinase expression is variable and not necessarily conﬁned to intimal fibroblasts. Synovial intimal ﬁbroblasts express several adhesion molecules, including vascular cell adhesion molecule-1 (VCAM-1), intercellular adhesion molecule (ICAM)-1, CD44 and β1 integrins . VCAM-1 expression (Fig. 8) is particularly unusual as it is absent from most other normal ﬁbroblast populations, whereas CD44 and β1 integrins can be expressed at lower levels on normal fibroblasts [1, 2, 18]. VCAM-1 expression on intimal ﬁbroblasts may be important in cellular trafﬁcking. The ligand for VCAM-1, α4 β1 integrin, is present on mononuclear leukocytes but not granulocytes, so the presence of VCAM-1 on type B synoviocytes in inflammatory arthritis may trap macrophages and lymphocytes within the synovial membrane while allowing neutrophils to egress into the synovial fluid. Complement receptor-2 (CR2, CD21) can be induced on synovial fibroblasts (but not other fibroblasts) in culture, although it is not expressed by normal intimal ﬁbroblasts . Decay accelerating factor (DAF), VCAM-1 and CR2 are all involved in B lymphocyte survival. 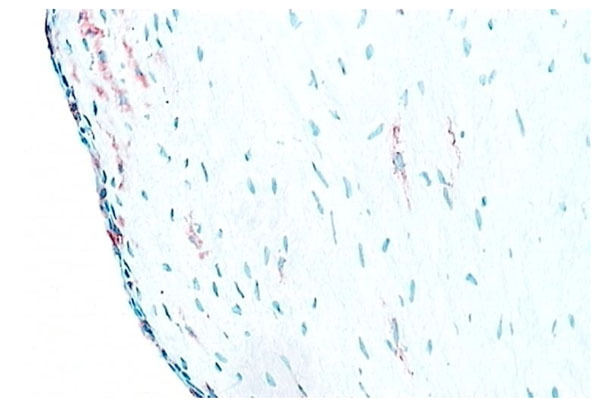 Intimal ﬁbroblasts are thought to arise by division within synovium either as a discrete self-replicating population, distinct from subintimal ﬁbroblasts, but more likely they are replaced from the subintima. If synovial ﬁbroblasts are disaggregated and cultured in vitro, they lose VCAM-1 and CD55 expression but the majority, apparently including cells of subintimal origin, will readily express these markers following cytokine stimulation. It seems likely, therefore, that synovial ﬁbroblasts in both the intima and subintima belong to a specialized cell population with a propensity to express VCAM-1 and CD55. Two recent studies have demonstrated the range of cells which can be found in the subintimal regions of the normal synovial membrane [2, 3]. CD3+ T cells, including CD4+ and CD8+ cells, can be found within the normal synovial tissue. Some of these cells have memory T cell phenotype and while they are likely to be simply trafﬁcking through the normal synovium, their role, if any, in the homeostasis of synovial tissue is unknown. It is also possible to detect B cells, plasma cells and granzyme B positive cells in normal synovium, although they are present in small numbers [1-3]. The intimal matrix has an amorphous or ﬁne ﬁbrillar ultrastructure, containing collagens III, IV, V and VI with little type I collagen. Laminin, ﬁbronectin and chondroitin-6-sulfate-rich proteoglycan are all found in the intimal matrix and are all components of basement membrane (along with collagen IV), but there is no basement membrane beneath the intimal layer in normal synovium [20, 21]. This may be due to the absence of entactin, which normally links other components in basement membrane together. Intimal microﬁbrils include: ﬁbrillin-1 microﬁbrils, forming a basketwork around cells, and collagen VI microﬁbrils which form a uniform mesh. There are large amounts of hyaluronan mainly in the intimal and superficial subintimal layers of normal synovium which disappears in the deeper subintimal layer. 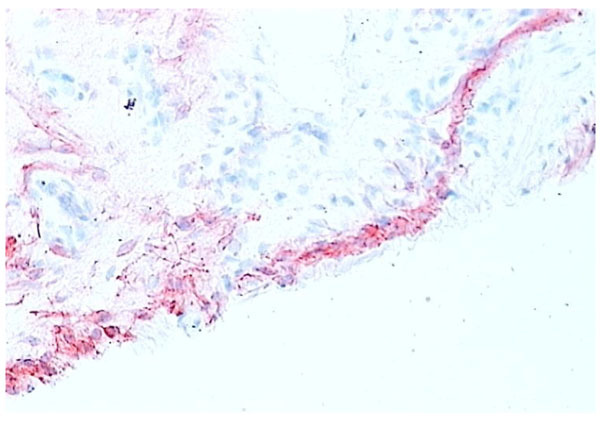 This may indicate diffusion of hyaluronan (HA) from the surface towards clearing lymphatics. Capillaries occur just below or within the intima (Fig. 9). Some capillaries are fenestrated and fenestrae tend to face the tissue surface; while small venules are prominent deeper within the normal synovium [6, 22]. Deeper still in the subintimal layer there are larger venules together with arterioles and lymphatics (Fig. 10), forming an anastomosing array . 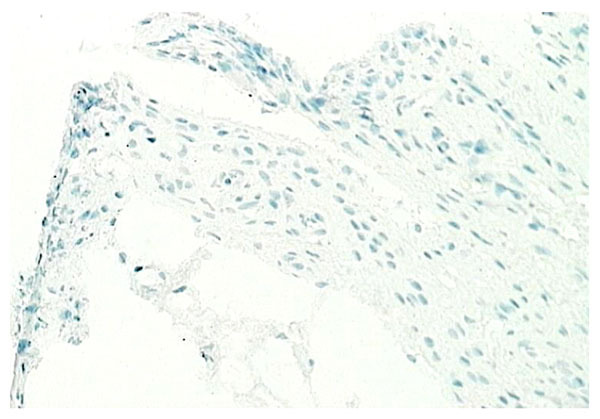 Vessels with lymphatic staining characteristics are prominent in RA synovium and it has been proposed that failure of lymphatic drainage of synovial fluid may be a cause of villous proliferation in RA synovial tissue. If this is correct, it is likely to be due to overloading of existing lymphatic channels with HA-rich extracellular fluid and leukocytes rather than a lack of lymphatic channels. Apart from the fenestration of superﬁcial capillary endothelial cells there is little evidence of specialization in synovial endothelium. 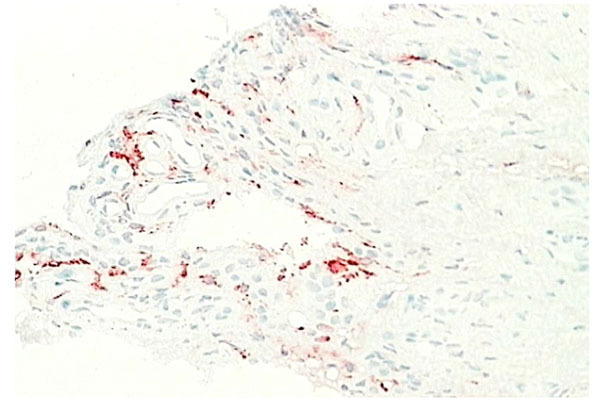 Endothelial cells enlarge in inflamed tissue and microvascular proliferation can occur but these events are common to inflammation at many sites. 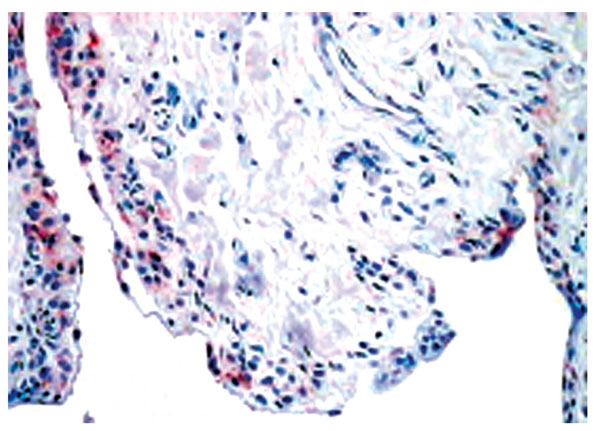 Tissue-specific adhesion molecules or “addressins” have been sought but no evidence of synovium specific vascular markers have been found. However, there remains the possibility that specialized lymphocyte trafﬁcking pathways apply to synovium, possibly based on chemokine-receptor interactions. Normal synovial tissue has a rich nerve supply [24, 25], including the sympathetic nervous system  most of the nerve supply is around vascular networks although it does extend into the intimal layers. Consistently reduced nerve supply is seen in synovial tissue from RA patients, especially in the more superficial intimal regions. Although inflammatory cytokine production can be detected in normal synovial tissue [1-3], including interleukin-1 (IL-1) (Fig. 11), interleukin-6 (IL-6) and tumor necrosis factor alpha (TNF-α) (Fig. 12), it is far less than that seen in inflamed synovial tissue such as in RA patients and the amount of anti-inflammatory cytokine production, at least in the case of IL-1 receptor antagonist (the naturally occurring inhibitor of IL-1), is far greater than the amount of inflammatory cytokine seen (Fig. 13). This would achieve the desired result of suppressing an inflammatory process in the normal synovium [1, 2]. Similarly, the amount of receptor activator of NF kappa B ligand (RANKL) (an essential factor for the development of osteoclasts) seen in normal synovial tissue is low [1, 2] and far less than that of osteoprotegerin, the naturally occurring inhibitor of RANKL (Fig. 14). The net result of this will be to suppress the formation of osteoclasts with the normal synovium and preserve homeostasis within the normal joint. The normal synovium provides a deformable packing that allows movement of adjacent, relatively non-deformable tissues [1, 23]. Areolar synovium may also have specialized viscoelastic properties for coping with the stretching, rolling and folding it undergoes during joint movement. The additional functions of the normal synovium include maintenance of an intact non-adherent tissue surface, lubrication of cartilage, control of synovial fluid volume and composition and nutrition of chondrocytes within joints. The ability of synovial fluid to lubricate cartilage surfaces is dependent on the presence of glycoprotein, especially a glycoprotein known both as ‘lubricin’ and ‘superﬁcial zone protein’ because of its localization to the surface of both synovium and cartilage . Hyaluronan does not appear to contribute to the ability of synovial fluid to lubricate cartilage in ex vivo systems but hyaluronan may be important in maintaining a film of lubricant on the cartilage surfaces in vivo. Hyaluronan is probably the main factor responsible for retaining a constant volume of fluid during exercise . This constant volume is probably important as a cushion for synovial tissue and as a reservoir of lubricant for cartilage. It is likely that the rate of synthesis of hyaluronan and its exportation into the synovial fluid compartment are dependent on the mechanical stimulation of intimal ﬁbroblasts and is influenced by the effectiveness of the synovial fluid cushion. Thus when synovial fluid volume is high, mechanical stresses on intimal ﬁbroblasts are reduced with a resultant reduction in the rate of hyaluronan production and vice versa. Joint effusions may result from mechanical irritation by worn bone and cartilage, with normal composition of synovial fluid and excessive production of hyaluronan by intimal ﬁbroblasts stimulated by frictional forces, such as in osteoarthritis. The cause of joint effusions in an inflammatory synovitis is likely to be due to an accumulation of exudate similar to a pleural effusion, i.e. an overspill from the inflammatory edema in synovial tissue created by increased vascular permeability. However recent evidence suggests that low-grade inflammatory and immune reaction may contribute to the pathogenesis of osteoarthritis, suggesting that these two mechanisms of effusion development may not be as distinct as originally thought .